Imagine – if you can – life without music. New Year without Auld Lang Syne, a wedding without that tear-jerking first dance song, or a sporting match without the national anthem that fills your chest with pride. It’s well documented that music has the power to strengthen social connections, promote relaxation, and boost recovery for mental health1,2. In fact, from the beginning of our lives to the very end, music plays a key part in every important moment – whether we’re celebrating or commiserating. The chorus of ‘happy birthday’ gleefully marks every new age we reach, and the poignant hymns console the grieving at funerals. And music has an uncanny ability to stay with us for years and years. You might not remember the name of that freckly guy you sat next to in your German class, but chances are you could hear a long-gone tune from your school disco days and find yourself belting the words with staggering accuracy. As the universal language that we share, music transcends cultures, time, and can truly influence how we think and feel. But scientifically speaking, exactly how profound and how lasting are the effects of music on our minds and bodies? 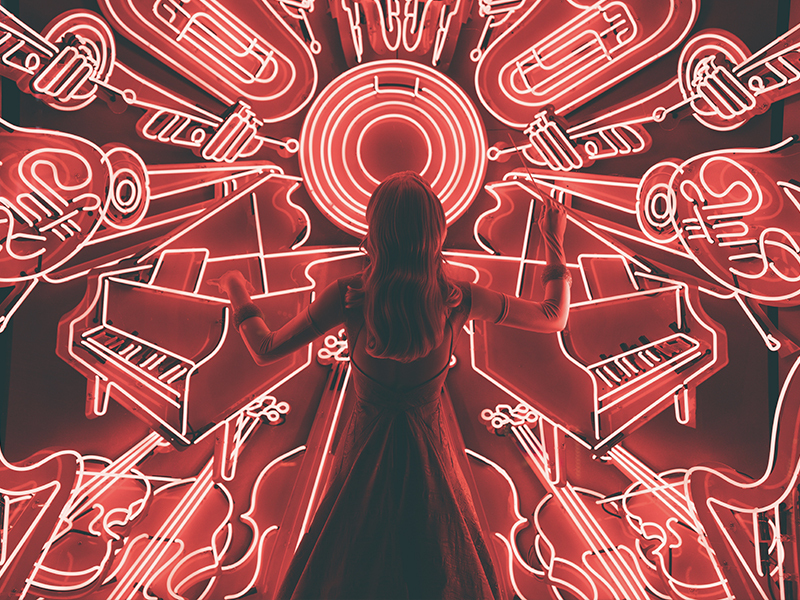 Very few art forms, if any, rival the way that music captivates our minds3 – and when we look at how melody affects the brain, it’s clear just how deep these connections go. As soon as music hits our auditory cortex, we see a symphony of activity across the brain. While the cerebellum breaks down the key components of sound – pitch, timbre, position and duration – the amygdala and frontal lobe process emotional qualities of the song, adding context and meaning to each individual piece3. Music we feel is particularly beautiful or touching often causes a swell of dopamine, the pleasure neurotransmitter. This is what gives us “chills”, also known as the autonomous sensory meridian response (ASMR)4. Our deep connection to music can even give our productivity a boost in a number of ways, like increasing motivation and enhancing performance in the work place5. In high-pressure environments, music has been shown to improve our speed and accuracy; surgeons who played their own playlist outperformed their non-musical counterparts6. Interestingly, learning an instrument has also been found to strengthen connections between key areas of the brain, providing life-long benefits for our cognitive abilities7. Much like a full-brain workout, regularly playing music helps to reinforce connections between visual, motor and auditory cortices – making us better at language learning, non-verbal reasoning and mathematical problem solving8. Compared to non-musicians, music players are found to have better memory – they can create, store and retrieve memories more quickly and efficiently8. Older adults who play music also appear to have biologically younger brains, which hints at a neuroprotective effect. Powerful stuff. Evidence is growing to suggest that music can help boost recovery and patient rehabilitation9. As a result, more and more healthcare practitioners are using musical interventions to reduce pain, anxiety, and stress for patients with chronic conditions. In particular, musical interventions have positively influenced cancer patients going through diagnostic biopsies and surgery10. They can even reduce radiotherapy-related fatigue and depression in breast or gynaecological cancers11. When it comes to neurological disorders, like Parkinson’s disease12, autism13, and Alzheimer’s disease14, music has demonstrated deep anxiety-relieving and rehabilitative effects. Due to its powerful mnemonic effect, music has the unique ability to bringing patients with dementia out of states of confusion15. Importantly, new research reveals that the area of the brain responsible for ASMR, or the “tingles” we feel from music, isn’t lost in patients with Alzheimer’s. This gives us a window through which to engage with people in the later stages of the disease16. Thanks to its wide-reaching and varied interaction with our brain, music seems to be able to access areas untouched by dementia, reconnecting listeners with the world around them. Tools like the BBC’s Music Memories website, are using music to help people with dementia listen to the songs they used to like, in hopes of jogging their memory: https://musicmemories.bbcrewind.co.uk/. Typically, music we knew between the ages of 10-30 tends to have the most profound effect – the so-called reminiscence bump – when it comes to unlocking memories17. So there we have it. Our favourite tunes aren’t just music to our ears, they’re music to our minds, too. Nilsson U. The anxiety‐and pain‐reducing effects of music interventions: a systematic review. AORN journal. 2008 Apr 1;87(4):780-807. Hung TT, Liu YC, Tsai PC, Lin MF. The Pain-Relief Efficacy of Passive Music-Based Interventions in Cancer Patients Undergoing Diagnostic Biopsies and Surgery: A Systematic Review and Meta-Analysis. The Journal of Nursing. 2018 Feb;65(1):70-82. Alcântara-Silva TR, de Freitas-Junior R, Freitas NM, de Paula Junior W, da Silva DJ, Machado GD, Ribeiro MK, Carneiro JP, Soares LR. Music Therapy Reduces Radiotherapy-Induced Fatigue in Patients With Breast or Gynecological Cancer: A Randomized Trial. Integrative cancer therapies. 2018 Apr 1:1534735418757349.
de la Rubia Ortí JE, García-Pardo MP, Iranzo CC, Madrigal JJ, Castillo SS, Rochina MJ, Gascó VJ. Does Music Therapy Improve Anxiety and Depression in Alzheimer’s Patients?. The Journal of Alternative and Complementary Medicine. 2018 Jan 1;24(1):33-6. Lok N, Bademli K. Effectiveness of Music Therapy in Alzheimer Patients: Systematic Review. Psikiyatride Guncel Yaklasimlar. 2018 Jan 1;8(3):266-74.